We are experiencing start-up revolution in India like never before. As per the economic survey, there were more than 19,000 start-ups in India in 2016. While the problem continues to be the fact that “lot of Start-ups never start up”, we are much better than a decade before. However, increasing number of start-ups also experience tough competition, unreasonable expectations & resource crunch. Lot more companies are bound to shutdown and lot of them would be struggling to survive and grow. Lack of growth can be a big challenge for Entrepreneurs who are funded, selling high expectations. Entrepreneurs may forcefit their dreams in a market that is just not big enough thereby bringing down the complete business. Pic 1 illustrates companies transiting through various stages of funding. As we can see, through this transition, quite a few companies shutdown and a large number of them would be stuck in the same phase. 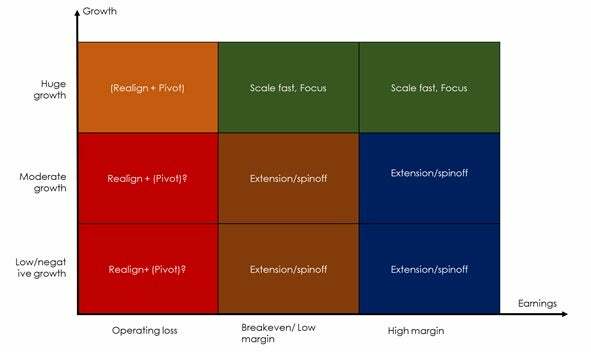 Companies who are stuck in a given phase can eventually become profitable with a “small % of the larger market” or “large percentage of a smaller market”. While this is perfectly fine for bootstrapped entrepreneurs, for Entrepreneurs with VC/angels backing, this can pose several problems. This article is about such companies who are strangled for growth and need to recalibrate themselves. Pic 2: Calibrating current position & available options. · Extension/spinoff to focus on new product/ market while existing business would continue to operate. - New Business can be carried in a completely different entity making it a spinoff. In most cases, Turnaround needs to be combined with a new business to achieve the objectives. Companies in this quadrant have an amazing product market fit. Just go ahead and execute the plan in hand. If the current business is doing well and is of a reasonably large size, it could be good to explore spinoff. Spinoff executed well can bring lot more value for all the stakeholders. But spinoff demands entrepreneur to find additional management and team which is normally not very easy in several organizations. While reworking on the cost, it is important to balance between resources and revenue that are extremely relevant for the future and the cost savings that can be achieved. Sometimes it is easier to align with the future when there are much better reserves/ net cash flow than a great revenue figures on the book. Making investors & team become part of the decision making and communicating with reasoning and detailed plan can help a lot in executing the strategy. Once you have all the forces, thoughts and interest aligned, go ahead and execute your strategy. You could be the next PayTM (Actually a pivot from One97 ). There is nothing much to lose considering the situations you might be already be in.